"Ride Captain Ride" was a hit in 1970 for Blues Image, climbing to number 4 on the charts. Blues Image was a band out of Tampa, Florida. This was their one hit wonder, but the members of the band later went on to play with other singers and groups including Iron Butterfly, Chi Coltrane, Bobby Womack, Alice Cooper, Three Dog Night, and Crosby, Stills, Nash and Young. 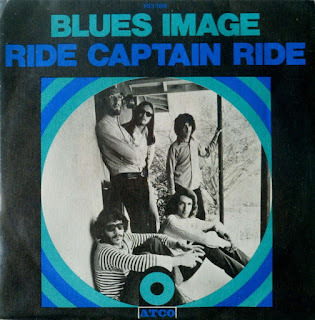 "Ride Captain Ride" was written by Blues Image members Mike Pinera and Frank "Skip" Konte. An interesting bit of trivia about this song -- it was inspired by the number of keys on Mike Pinera's Rhodes piano: "73 men sailed up, from the San Francisco Bay." This song reminds me of childhood summers, of the beach ... happy memories. Do you remember this one? I'd love to hear from you in the comments, below.